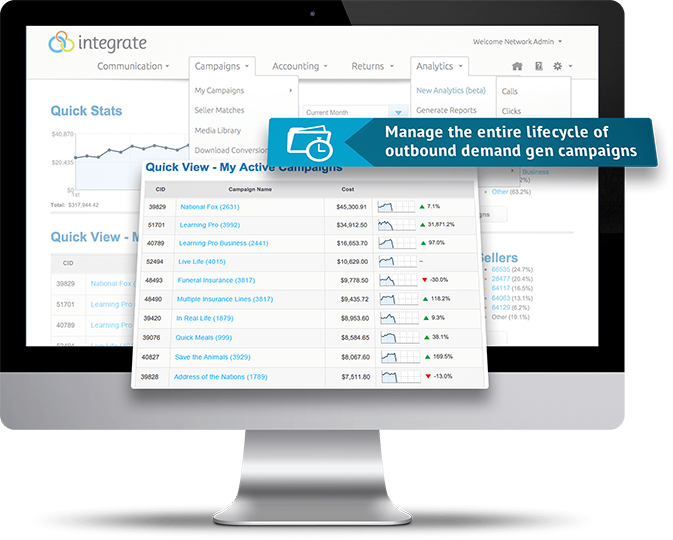 Integrate is a provider of demand orchestration software, enabling marketers to automate top-of-funnel demand marketing efforts. The software works with marketing automation and CRM systems, as well as ABM and predictive software, to build holistic, predictable demand marketing engines. The end results are more efficient marketing organizations; cleaner, faster prospect data; and scalable contributions to pipeline and revenue. Pros: Integrate has great communication. As an affiliate I appreciate all the "heads up" emails alerting me to new campaigns that are available. Cons: As someone who's not a seasoned affiliate marketer, I find Integrate Network difficult to understand. I'm used to far more basic systems like those from Partners.Mysavings.com and EscalateNetwork. Of those two, Escalate is the most user friendly, with lists of offers that are available to run immediately, easy-to-find links and easy to implement campaigns. Overall: To be honest, there are a lot of affiliate networks out there, and I tend to forget about offers that I'm not approved to run as soon as I see them. I understand that you need to have controls in place, but as a "mommy/deal blogger" I find myself returning to the networks that are the easiest to understand and work with. I also like the networks that don't inactivate users after an amount of time of no use. I might not be your typical publisher, which means I might expect different treatment. There are LOTS of networks out there and, as a busy WAHM with other responsibilities, I can't cover all affiliate offers and/or networks all the time. Not using the network for a time doesn't mean I'll never use it, but deactivating me almost certainly means I'll find future offers elsewhere. Thanks for your time. I do appreciate the opportunity to share feedback with your business. Pros: I have been using the Centralized Media Management Platform for almost half a year now and it has been meeting my needs and then some. The superlatives about this product that come to mind are "ease of use", "data-rich" and "connected." But in simpler terms, I am/was able to use this on my own without any technical support from day one. Very few platforms offer this type of quick learning curve. And when faced with client demands, it was imperative that I worked with a system so user-friendly and intuitive. I also love how I can turn on and off reporting frequency and types of communications with a flick of a button. Finally (and last but not least), the customer service I have received has been beyond exceptional. Even when we started out with a small purchase, we were treated as if we were spending a million dollars. And that level of service has only grown stronger over time. I can't say enough about the knowledge, professionalism, and attention my rep provides. Cons: As with every platform, there are some areas of opportunity. Mostly, I think this system needs help with reporting. Reporting is often a little difficult to understand and the reports are often a little hard to explain to the end-client. It's workable but I believe this is one area that could use enhancement. Also, some of the notifications need explanation. Once you learn how the media management happens, it makes sense but some of the notices can be a little confusing (what actions do I take, if any). Overall: Overall, super super impressed. Managing a large number of clients, I truly appreciate the fact that my learning curve was so quick, like almost immediate - something that most other platforms can't claim. Furthermore, once into the system I can easily see my campaigns, campaign stats and know quickly what actions I can take to enhancement performance. And I also have my weekly talking points with clients literally right in front of me. Reporting aside, I give this system my full endorsement and highest recommendation. Overall: Tried ClickBank and countless other comparable platforms. Integrate offers a wide variety of offers from trusted brands and small, growing brands alike. I'll likely use Integrate very soon on other sites I operate and contribute to, as the residual income is great. For most businesses, the income will be mostly supplemental until you build trust and quality content around the offers to improve conversions. I am very happy with how responsive and flexible the Integrate team has been. Erica is particularly fabulous! It's great when you form business partnerships, not mere consumer relationships. Your experience may differ depending upon the offers you choose to promote. I find that small businesses and startups are more agile and willing to help you help them. During such campaigns, everyone wins! While we are equipped to go direct with many of the brands in Integrate, it's nice to have accountability partners and extra help. Integrate does a superb job building trust. Pros: I really enjoy the layout and design. Not only is it very intuitive, it is an easy transition from any other platform I've worked with so the learning curve is cut in half. Even so, it was helpful to have the additional videos available if I had questions about managing a campaign that I was too embarrassed to ask my account rep. The ability to browse new sellers is fantastic, and I find their descriptions incredibly helpful. For the most part the reporting is fast, and does not hang, which has been the case with other similar services I've used. In addition the notification section is a great addition because it stores a much better record of correspondence from Integrate to me, as opposed to me having to search through emails to find Integrate only messages. Cons: There really aren't that many negatives about the software, they only issue I really have is that it is difficult to submit returns, especially if you aren't familiar with doing so. It would be much better if one had the ability to search for leads based on email or some other stored data than transaction id, lead id, or IP address. If it was then brought up from the search and gave you the ability to select the return disposition, I think it would make the entire process easier to complete. Only having experience as a CPL buyer this is my only suggestion/con. Overall: As stated the pros really outweigh the cons. Even after a dip in volume and effectiveness on the campaigns we were running, I decided to reach out again and inquire about new campaigns/verticals/business opportunities that we could try with Integrate. While outreach certainly played a large part in this resurgence of interest, the great tools at one's disposal definitely played a large part. Pros: Having a designated account support representative made a world of a difference in the implementation of the platform. A two day training session was provided and encompassed all our concerns and questions. Cons: The transition from our old standard business practices to the new media platform was not as smooth as we would have liked. Getting set up fully takes a decent amount of time and work but completely pays off in the end. Overall: Our primary use for the Integrate media platform was for our lead generation business. Campaign set up was streamlined and simplified which eliminated the possibility for manual error in the process. Our clients saw fewer errors in their reports which reflected greatly on our company. This platform created more business opportunities for our company because of the data pass capabilities and custom creative that is generated for each individual campaign. Simple, streamlined and fully supported. Pros: Excellent Introduction and Overview of Integrate system. The potential for use and expanding our client base was promising, and the utilization of the Integrate system was certainly unique. Daniel Flannery has been our point of contact, and has been fully invested in not only getting us introduced and working with Integrate, but has been walking us through each step and has been excellent in the service that he has provided thus far, including our concerns noted in the "cons". Cons: Unfortunately, we have had two sellers to-date, and both of those sellers have instead of utilizing the "ads" and/or media to promote our service/products, have instead elected to enter information on potential clients, using their specific contact information - inputting that information into the form collection and then submitting them as "hot leads" interested in our product. This does not construe a valid lead in our position, as our live follow-up with these individuals has resulted in these VIPs not having any idea that their information was being utilized in this way, and having no interest in our product. Again Daniel has followed up on each of these issues, but to-date we have had no value for the Integrate service. Overall: We have a new proposal by Daniel that he will be presenting to us in the coming days. At this time, I would not recommend Integrate without fully explaining our results, but would certainly include an attribute about the high fidelity of customer service and the desire to definitely make a campaign work for us to generate new clients and revenue. Pros: We've been using Marketplace for 4 years and it's been a great mix to our direct buys. The team that manages marketplace is stellar and makes everything pretty effortless. I personally enjoy the total managed service aspect where I just provide them the content and they take care of getting everything setup and sending for approvals and providing reporting. Cons: The question I always get from my colleagues are they want to know who is in the marketplace, what vendors participate, and this is not something Integrate shares. All of the vendors are given numbers and that's how reporting is given. Pros: The pros of using Integrate for me is the communication from the support staff. I find this far superior to most of the other platforms I use to generate leads. Cons: I am not actually a fan of the portal display. Overall: If finding new campaigns was easier i would definitely use Integrate more. My click through / earnings rate has been good with most of the campaigns I've run. Pros: We have received a tremendous amount of help and support through Daniel Flannery at Integrate. It can be hard learning a new platform, but Daniel has walked us through every step of the way. As an agency, it can be hard collaborating each part of a marketing campaign. The Integrate platform would be able to let us see metrics and reporting that we need to then communicate to clients - usually platforms offer limited amount of reporting. It will be great to partner with Integrate for our CPL campaigns in 2013. Cons: We first started working with Integrate in the summer of 2012. It took us a while to find our comfort zone with the platform simply because we had never used a platform like Integrate (which isn't a bad thing). We wanted to see more on Integrate's relationships with publishers, because their names and outlets are held confidential. It can be scary as a seller using these types of campaigns to not understand who will be exactly pick up your campaign. However, working with Daniel has helped us feel more comfortable with the unknown. Overall: It would be great to hear more about who Integrate is partners with, not necessarily names, but to hear hints about whether who we're thinking as an audience is parallel to who the platform can reach. We understand privacy policies, but this is the only factor which has made us hesitant. However- we are still eager to try out the platform and believe Integrate would be a great platform to partner with. Pros: My account manager is absolutely amazing. This is the first company that I have enrolled with to have pursued me and made sure I was all set with registration. When I needed something, I asked and I received, no problems. She offers over the phone assistance which I have not yet taken advantage of but typically with other media companies I can not even get an email reply. Cons: I wish the set up was a little easier to use. The Integrate platform is very confusing to navigate or figure out on your own. I have been working with media companies for about a year and usually can log in for the first time and have my way figured out within minutes. I have to honestly say that I do not feel the same with Integrate. There is A LOT to take in and I just feel like to someone who is new new, forget it I think they would give up on it. I personally have not spent much time there yet because I do not have the time. I need to be able to log in to an account grab a campaign and be out. If I log into Integrate right now I would spend 20 mins finding and setting up a campaign to even be able to run it. Overall: I recommend Integrate to advanced media/affiliate users and I tell them they can expect wonderful interaction for their account managers and a great selection of campaigns. I just can not say it is easy to use or get use to. I will however be finding my way around eventually, I won't give up! Pros: The thing I like best about Integrate is their awesome customer service. My affiliate manager (Jenna Jurewicz) is VERY good at her job. She replies to emails and comments asap and notifies her affiliates ahead of time when she will be missing work for a day or two. Communication is really important. Once people stop responding it kinda makes bloggers panic and think they worse. This is what I have noticed from past experience. Cons: Integrate is a complicated system to use and learn. I really appreciated and attended a live webinar about 8-10 months ago. I think the guys name was Matt? This was really helpful learning the interface. Having additional sessions like this (monthly) would be a big help. Most other platforms I use are Has Offers based. The other thing that I do not care for is the bidding process. This is the only company that I partner with that does this. I guess I just like being told what I am worth! Overall: If I had to make a recommendation for Integrate, it would be positive just based on the variety of offers and the excellent customer service. I appreciate being paid and on time which is another one of Integrates strong points. If there was anything that you were gonna focus on is email communication. I love how other affiliate companies send over an image. Sometimes I can take a look at it and decide in a few moments if it is something I'd like to run. The I go in and grab my links. Pros: We are a small boutique performance agency so we primarily use the product on both the buy and sell sides; some deals we source to Integrate, others we run for them. Customer service and help in getting things set up was seamless. I like the fact that everything in the system is centered around being transparent so as a buyer you can really control who runs your campaigns and the various traffic channels. Cons: The ONLY issue we had was having to switch back and forth between our buyer and seller accounts. When I mentioned this to the Integrate team they had their developers fix the issue within a few hours - an example of great customer service. Overall: Overall, I think it's a great product. Unfortunately we probably don't utilize all the bells and whistles for our immediate needs as an agency, but I have seen the capabilities and I think it has some really nice features. Pros: The return methods provided by Integrate via their dashboard are very helpful and straight forward. I also like the reporting methods. They are clean and easy to read. Cons: I find it incredibly hard to find the most relevant campaigns for my website. To be honest, I have not used integrate as I should because of the time I know it takes to dig into the dashboard to find the campaigns that my readers would find relevant to them. When I click on "Browse Campaigns" there are too many options available to me. I don't have time to click through and find what I need when other affiliate companies provide a more simple, straight forward format with what I need, available immediately. Overall: I would like to see the customized affiliate campaigns that fit my site available immediately on the dashboard when I log on with a link ready to import to post. Better yet, would be an option to pre-select companies I would like to work with, so that I am pre-approved when they have a campaign and I can easily find their coding to run said campaign. The customer service available is incredible. And I appreciate that Integrate is available for questions and is approachable. I am very selective and post only campaigns that I know are a fit for Cleverly Simple, no matter the compensation. My integrity in posting is what has continued to give my site growth. I think Integrate is in line with the values I want to convey to my readers, I hope that in the future, the ease of use from the dashboard would improve and be simplified so that I can utilize Integrate more often. Thanks! Pros: The Integrate platform allows us to quickly engage with advertisers by qualifying the campaigns that match our strengths. As a marketing company, we know what our strengths are, so being able to quickly identify advertisers that are looking for our strengths increases our efficiency. The Integrate platform enables us to focus on what we do best! - messaging between the publisher and advertiser - gets you the exact answers you need right from the source! Cons: The reporting interface is robust, but there are no quick and simple reports...each report must be from scratch (although you can save a report you've run in the past and re-run it). Additionally, real-time scrub rates from clients should be included in the system. Overall: I recommend Integrate. It's so good that at times I've been hesitant to discuss it in the industry for fear that my competitors might jump on it! If you know how to generate traffic, leads or actions, but don't want to deal with the hassle of sales, Integrate is the place to start! Pros: The tool is easy to use. We have received several good quality reviews since using Integrate. We have significantly increased the number of reviews on our website by using the incentive campaign (where users receive Swagbucks in return for writing a review). Cons: It does take some time to weed through the reviews because unfortunately there are bad reviews as well where people are just submitting reviews to try and get Swagbucks. Fortunately there are more good reviews than bad. Also, we get a lot of requests to add new businesses to our database but these aren't legit requests. This is a little frustrating, because again we have to review all of them to see if they are legitimate business that need to be added to our database. Overall: Integrate is a great way to capture additional reviews for your website. We have had steady traffic coming in from the site. If you have the time to read through the reviews, then I definitely recommend it. Also, for us we have our reviews set up to require approval before they are posted to our website. If another business did not have the capability to do this (i.e. their reviews automatically post to the website), then I'm not sure this would be the right tool to use. I don't know how other review systems are set up. Pros: The system is simple to navigate, and easy to manage. It's relatively fast to set up a new campaign. The ease of processing returns is something you don't see often in a competitive situation. I think Integrate has really put this together well from the buyer side. I like the visibility into each campaign. To be able to see the entire operation on the campaign screen is a nice feature. The reporting is also very well done. The ability to download all of the reports as well as the recordings really makes it easy to manage the leads. Cons: In our particular field we are having a tough time finding vendors (Integrate publishers) that can deliver a consistent quality lead. Overall: It has been very easy to manage - and the transparency makes it fast to determine quality and manage accordingly - which is great. I think as a lead buyer that the Integrate system is really pretty intuitive, and they are great to work with. We have tried several publishers that we have had to shut down due to quality, but we are continuing to find and test new ones. While it's been a bit frustrating on the quality side, it has been incredibly easy to identify that and make the necessary changes. Pros: The functionality of the platform is very simple to use. Along with the simplicity of the platform, the customer service is great. Account reps are very helpful in answering questions, and much more. They are constantly working to help connect profitable buyers and sellers together. As a buyer or seller you can tell them what you're looking for and they will try their best to link you to the perfect connection. Cons: I wouldn't call it a con, more of a tedious task, I've found with the platform is that call criteria is broken up into different tabs. For time management I've found other platforms have it all listed on one page and you don't have to click around to see details. Other than that, everything thus far has run smooth. Overall: I enjoy using the Integrate platform. Working in direct response advertising industry for over 15 years I have worked with numerous companies that utilize call tracking platforms and other necessary software to run a smooth successful business. Overall I have had minimal hiccups on both the buyer and seller side. The software has only been a positive for my company, increasing revenue and strengthening my relationships with clients. Pros: This system has a great communication feature. I never have to wonder what is going on inside of Integrate. In addition to the actual affiliate dash, I am very comfortable with my affiliate manager. I have no doubt that she will go above and beyond to make sure I am always in the know. The offers themselves are very easy to apply for. The creatives are easy to locate and install. I am also very happy with the ease of inserting Sub Ids as we use them on nearly every campaign that runs on my site. Cons: The reporting feature leaves a little bit to be desired. I have a team of 15 admins and each uses their own sub-id in their posts for compensation purposes. When paying them, it is somewhat cumbersome to determine what they have actually earned based on what has been paid, etc. It is not as difficult on other affiliate dashboards that I use. Overall: I couldn't be happier with this firm. I would like to see some improvements on the reporting, but overall the relationship is solid and I am very happy with the experience to this point. Pros: The format of the site is pretty easy to use and similar to other affiliate network platforms in some ways. It is easy to navigate and there are many support videos to help you understand how to use the site. Once you spend some time on the site and activate a few campaigns you can get the hang of things easily. Cons: The difficulties I have are not with the site itself but with some of the terminology used and understanding how the system works. The overall look and feel of the site is a little intimidating for somebody not familiar with it mostly because of some of the unfamiliar terminology. Overall: I would recommend Integrate to other bloggers and affiliate marketers but probably more so to users with some experience. As noted above it can be a little intimidating for novices. I think overall the support you get definitely makes things easier and anybody could learn to use the system if they put a little time and effort into it. The campaigns are great with many to choose from. I have no regrets partnering with Integrate. Overall: Great, easy to use platform that should be Integrate(d) into any marketing campaign. It is a self-service platform though so you really get as much out of it as you put into it. Pros: The customer service we receive from our representatives has been remarkable. They have proven to be very reliable, quick to respond, and always helpful. Daniel Flannery and Amanda Hunter have been exceptional and we appreciate the partnership. The integrate.com website is very easy to use, the walkthroughs are helpful with managing our campaigns as well. Cons: When returning a lead per CPL model, it is time consuming to negotiate every return with a more detailed reason on why we have to return it due to the disposition of "Does not meet Criteria". I recommend adding more return reasons such as "Direct Competitor", "Already purchased" "No longer interested"
Overall: I would recommend having integrate.com reporting easier to view, ie. bar graphs. Make it easier to pull a report that will look per campaign each seller with a breakdown by day for current and past months. Right now the breakdown is monthly when you are not in the current month. Pros: Access to seller profiles. media types, and conversion types. Too many email updates (perhaps the ability to change email contact preferences would help, daily summary perhaps instead of as events occur). Self service is good for individual buyers with a few offers and/or dedicated staff managing their campaigns in the system. A little tough to manage on a self service basis as a network unless offers are limited to just exclusives and/or staff member can be dedicated to campaign management. Overall: Overall, good system. Provides a functional marketplace and tracking platform for both buyers and sellers to negotiate and deal with one another. Cons: We have run into a couple of outdated or incomplete campaigns. However they were quickly updated. Overall: The Centralized Media Management Platform that Integrate uses is extremely user friendly. It it easy to see at a glance which campaigns are performing, how much revenue is being generated, when campaigns are expiring and what new campaigns we may be interested in. We like how we are able to communicate directly with the advertiser to negotiate terms and the prompt responses that we receive from the advertisers. April, our day-to-day contact at Integrate has been instrumental in the launch and success...she is always watching new campaigns and making recommendations for ones that may perform well with our websites. We have tried using similar platforms and affiliate networks over the years, but the Centralized Media Management Platform that Integrate uses is by far the most comprehensive and easy to use. Integrate ~ My go to for the best of all that I need! Pros: I absolutely love Integrate for their service and quick responses to my needs. There is never a time where my questions go unanswered or I am left hanging not knowing an answer. I love the fact that I can always get in touch with my campaign manager and she is always ready and willing to help. The interface is so easy to use as I always know ahead of time what campaigns will be pausing, or starting ahead of time so that I can make plans for my website. Integrate is my go to affiliate program first and formost! Cons: I honestly don't have any cons about the program. I am completely pleased with how smooth things run and don't have any complaints. Overall: I highly reccomend Integrate to anyone who is looking to promote a product or like me sell products. They always go above and beyond your normal company. If you are on the fence about Integrate I say go for it. You will not be dissappointed. Pros: My product specialist, Lissa Regets, is there to help me set up each new campaign and seller. She makes working with Integrate easy and successful. My client is very happy with the quality leads they receive. Integrate was also able to create banner ads for free for my client to test a new seller. Cons: None! The only issues we had at first were using one unique phone number for multiple sellers and billing using the broadcast calendar. Integrate now sends weekly call reports showing each call that came in and invoices us based on broadcast calendar. Any issue that came up my product specialist Lissa was able to iron out. Overall: Overall, we are happy with the quality leads Integrate is delivering for our client. We hope to continue to add new sellers to increase our weekly call volume. I would refer my product specialist Lissa to anyone interested in working with Integrate. She has made this a successful partnership! Pros: Integrate's technology is unique, as it allowes affiliates and advertisers to communicate and negotiate a payout rate different than what the initial posted payout is. The AM Lana Chapman is always available, helpful and ensures her affiliates get an excellent service. Also, the system has a feed that allows for notices across the network. Cons: The only down side is that the negotiation process between the affiliate and the advertiser takes a couple of days, so the it elapses the time between your application and the possibility to go start running traffic. The upside of this is that you will have tailored terms and you'll be able to balance your volume according to the terms of the negotiation. Overall: The best part about Integrate is that their innovative system really helps you to make your campaigns profitable. They have a fresh approach to affiliate marketing and bring unique value to the business. Pros: I have found the Integrate platform to be easy to navigate when looking for new buyers. Browsing and requesting new programs is simple and streamlined. The account management is second to none. Mike is always helpful, follows up and works hard fur us. He also takes the time to match us up with programs we can be successful running. The extra care and attention to detail is fantastic. Cons: Some of the payouts can be very low, usually we are able to work it out though. It is also challenging to run call center projects without the direct client interaction. Having that interaction generally makes projects more successful between directly knowing client expectations and managing results. Overall: I recomend Integrate regularly. It is a great platform to buy and sell leads. Very user friendly and a fantastic way to fill in gaps in your call center schedule. Pros: The staff at Integrate is very friendly and easy to work with. Whenever I have a problem or question, it is always answered very quickly. It is user friendly to log in and grab links and creatives for approved campaigns. I like the vast variety of campaigns that is offered at Integrate and not the same old offers that we see at some affiliates. I love that Jenny, my account manager, emails me with campaigns that are converting well. Some days I don't have time to log in or check the Facebook group. Cons: For me, it is difficult to search for new campaigns, I'm not always able to find what I'm looking for. For instance, if I type in what I think the name of a campaign is, I am never able to locate it. That might be user error, also. Overall: Overall, I do like Integrate and my plan is too use them a lot more this upcoming year. Pros: Integrate has MANY offers to choose from. I love the variety. The payout is very competitive and I do like that we can request a higher payout on many offers. I also think the tracking is very good. Cons: I don't like having to get approved for offers. Applying and being approved is time consuming and many times the offer is over or not as hot once I get approved to run it. I'd love to be auto-approved on more offers. I also tend to forget about the offer if I don't get approved right away. It took awhile to understand the platform/back office as well. I think it could be easier. I do recommend integrate to other bloggers often. I think the payout is great. I think the customer service is great. Those are 2 things that are very important to bloggers like myself. Having an email directly to my affiliate manager is a HUGE plus in my book! Integrate - Simply The Best! Pros: Integrate has the best platform that I have ever used, and I have been in this business for well over 5 years. It is incredibly rich, and offers an array of features that is simply unequaled anywhere that I have found. Regarding customer support - I can tell you that you would have to look for a very long time to find customer support that even approaches Integrate's customer support. I deal with companies, clients, and associates 7 days a week, and there are none that I would recommend as highly as I do Integrate. Overall: My review title pretty much says it all - I would (and I do) recommend Integrate without hesitation. They strive to excel every single day, and I have never had even one problem with them. I cannot say that about any other company that I do business with. You will not regret working with Integrate. Wow!! Ground breaking software. Super easy to use. A++ for Integrate. Pros: In-depth training provided by Integrate's corporate trainers made the transition flawless. Campaigns were simple to setup and optimize with the help of their support team. They did the majority of the heavy lifting for me which I am not used to experiencing. You can really tell that customer satisfaction is what they value above all else. Cons: I was a little skeptical giving over the majority of my marketing budget to such a new company but they delivered from day 1. Overall: I would highly recommend this software to anyone in the advertising space. The experts at Integrate helped me with everything from my marketing strategy to making sure my ROI was right where I need it to be. I was blown away with the way their in-house creative team was able to implement all of my preferences into the campaign. I will continue to recommend their services as my experience was top notch. Pros: Easy to use and obvious navigation. All of the cons that I have are made up for by the excellent customer service and support I get to help me find what we are looking for. Cons: A lot of campaigns to sort through, many of which we cant run. Hard to tell when initially browsing whether a campaign is linkout or host and post. Co-reg is technically what we fall under, yet there are very few campaigns that accept this traffic. Overall: Be able to sort (in co reg) by linkouts or Host and post. Co-reg seems to have a bad rap as most camps dont accept this type of lead. We have content based (non incent) sites that perform very well for our advertisers. -That being said, Sarah Styron has always helped me find what i was looking for, and/or helped us get special approval for certain campaigns typically when we disclose sites. Therefore, it hasnt been that much of an issue. Wish I had signed up sooner! Pros: Jenna has been my main contact, and she has been incredibly helpful in helping getting me set up. I love all the offers available, and I see a lot that are not available with my other affiliate sites. Once I got used to how it works (having to apply for campaigns and such), I see how easy it is, and I wish I had utilized this site long ago. Cons: For someone new to the site, I think it's a little intimidating at first. I have never had to apply for almost every campaign, get approved, etc. I had signed up a year ago, but never used the site because I wasn't sure how to start utilizing the site. I still have occasional questions, but they are always answered quickly and professionally. Overall: Maybe offer a more understanding step-by-step for new users. Otherwise, I think it's a great site! Pros: * Love that you can view pub history, % returned, verticals, etc. The profile really helps you decide whether or not you think they'll be a good fit. * My reps (Jordan Hall and Sarah Styron) are fabulous. They are very responsive, helpful, and pro-active. * While we only work in the affiliate marketing space, I definitely like that Integrate offers about every kind of media. Cons: Sometimes it seems a bit laborious to navigate everything and communicate with pubs because you feel like you should be able to communicate directly, but it's understandable because otherwise everyone would work direct. It's a necessary aspect, but I do wish I could send and receive emails from my inbox. Pros: The system is relatively easy to use once you understand it. I do like that I have the ability to negotiate rates and offers and to browse all existing offers I also like the landing page layout. Cons: It is hard to find new offers, I would like to see new offers listed on the homepage and also have more offers matched to me or let me know when new offers are added automatically. I also appreciate when offers are on auto approve as I'm often looking for content to post right away and I might apply and then forget to go back and post once I'm approved. Pros: Integrate's account team is superb. They are responsive, collaborative, creative, friendly and helpful. The online interface is intuitive, easy to use and has all the information you'll need within a few clicks. Getting creative approved is easy and fast. I haven't had any issues with fraud or problem affiliates. Cons: I would like to have more direct interaction with high-performing affiliates so we can brainstorm on marketing and promotional ideas to maximize sales. I can't figure out how to track affiliates who have turned down my program so I don't keep reaching out to them. Some of the largest discount sites aren't on your platform. Overall: I'd recommend Integrate for people looking to expand their current program or looking to test the waters in affiliate marketing. Pros: The Integrate system is very easy to use as a buyer or a seller. Erica, our account rep, helped go over the platform in detail and promptly answered any questions that I had during the process. Training and setting up the campaign was done with help from the team at Integrate by using the share screen feature and on a training platform. The account reps and customer service reps are more than happy to help give their advice and opinions on what will work best for your campaign. The ability to turn off and on a campaign is a very desirable feature that Integrate's platform offers. Cons: Shuttlefare.com has yet to run into a con. Overall: 10/10! We wouldn't use any other Media-Management system due to the user-friendly interface and amazing customer service. Pros: I have worked with Integrate.com for several years through a variety of opportunities. They consistently have provided excellent service, even as they evolved into a bigger, more global organization. I have found the quality of their affiliates to be very high, especially in areas where the industry is littered with poor-quality offerings. Cons: Sometimes the 800# system can make it difficult to reach a department, so get a direct dial number as quickly as possible. Overall: It is great to have a partner that you can count on, and you can count on Integrate.com. What began as a tiny $1800 account two years ago has now grown to a very healthy six figure relationship, because the Integrate team knew how to make the most out of our offers. They are dedicated to quality and integrity which makes working with them a dream. Pros: I think integrate can really help drive qualified leads we are looking to generate and do so fairly easily for us. The support is great. Katie has been great to work with and has reallly taken a lot of the heavy lifting off of us. Cons: I think that we sometimes get crap reviews from thre resellers. But that said, there are many that seem legitimate and the other positive for that cons is your process of rejecting the leads has been very smooth and without issue so I really can't complain. We would love it if there were more resellers or larger community to reach our goal more quickly. Overall: I really think we've had a positive experience with integrate and would highly recommned others try it - either our clients or others directly. I think it's easy and it delivers good quality results. Pros: The platform is very user friendly and easy to navigate. The campaign notification feature by email for any activity makes forgetting critical actions impossible. The form set up and the form instruction table captures all the specifications of the campaign in detail. Cons: The lead return feature can be more robust and real time so that sellers get a chance to replace leads in the same calendar month. the Net 45 payment terms can be bettered to Net 30. The campaigns search feature and be made more user friendly. Overall: All in all we will rate the platform a 4 out of 5 stars. It is a great tool which helps in Real time lead exchange. It give access to a huge pool of buyers and sellers and the attention to details on the campaigns specification and the campaign set up helps you in eliminating and errors. Pros: I started started using this system and so far it has been great. There is so much available so it is a little intimidating at first but it's a wealth of information and will be so great to help monetize my website better. My contact for the program is excellent and she walked me through the program and explained all the features to me. She is also very responsive and available when I need help. I would recommend this to anyone else who has an online business they are looking to grow. Cons: It's a wealth of information so can be a little intimidating at first. If you take some time and filter through you will learn the ropes and be on your way in no time. Overall: Great product and would confidently recommend this to others. Cons: I think the emails are a bit overkill - everytime anything happens to the account an email is sent. I think a buyer or seller should have the ability to filter what email updates (if any) they would like to see in their inbox. Or maybe have a daily recap email go out - this will outline all the updates for the day instead of individual emails. Overall: Overall recommendation is to make the email side a bit more efficient - please see recommendation listed in cons box. Pros: The front page has a nice snapshot of vital information, such as month to date statistics and current active campaigns. Plus, they have a widget to help me quickly find the top and newest campaign, if I'm browsing for new campaigns to pick up. Cons: Sometimes the system can be a bit confusing for the user, especially if I'm searching for a specific campaign to get approved for. Overall: Overall, although the Integrate software can be a bit confusing at times to navigate, Integrate does a great job in providing a personal walkthrough of the software via the phone, and they also offer videos that walk you through various features. I like how I can see my major statistics at a glance on the front page. Many companies require me to go to a separate tab and run reports to get the same information. Pros: The Integrate platform is a robust platform that offers various options for managing our campaigns as well as reporting. It provides us the flexibility to customize per our requirements. Cons: Integrate is very good with on time notifications via the message center as well as via emails. Email notifications on the platform are plenty, so you really have to pay close attention to the emails, to ensure that important information does not get overlooked. Overall: We have worked with Integrate for a number of years, and have seen some significant advancements in their platform, far exceeding most their competitors. The team at Intergrate is top notch and have exceeded our expectations on several occasions. I would highly recommend working with Intergrate, and their team. Pros: Jenna is a wonderful affiliate manager. Plus they have a facebook group for further support, which is awesome. They have taken some suggestions and implemented them. I like that they now have the title of the affiliate in the title of the emails and not just the cd #. They get some good campaigns and have some really great payouts. Cons: One of the things I find extremely frustrating is the emails I get - the no conversions emails are not necessary. I feel like I get too many emails. I would rather not get emails telling me about an updated creative. I would however like to get emails telling me of new promotions. When I get sooo many emails, I start to just tune them out. I feel like some of the campaigns they get are spammy and I would rather not waste my time looking thru things to figure out if something is spammy or not. I have applied for campaigns, only to realize later that they are spammy and not great. Overall: I think Integrate is great for somethings and for some campaigns. At times, I just get overwhelmed with all the emails and with the platform, so I tune it out. I wish they would get rid of spammy campaigns. I love that there is a facebook group and that I can email my affiliate manager, so they have good support. Pros: Unlike other affiliate interfaces it is nice that you can communicate directly with advertisers and set your own caps and payout negotiations. Cons: I find that many advertisers don't communicate very well or in a timely manner. For instance you might ask them a question and they don't seem to respond. Also, it is a little irritating getting so many email notifications and somewhat harassing emails from buyers wanting more traffic. Overall: This is a very unique affiliate system and it has the basis for being very good. I think the line between the account managers and the system itself are a little blurred, ie. at what point do account managers do some of the things the system communicates as well...payouts, new offers, talking with buyers directly. Pros: Integrate's platform has many unique and useful aspects. Some of the best are the communication features between buyers & sellers, the straightforward campaign information pages, and the ability to search for campaigns across an impressive set of verticals/channels. Cons: The only real con with the Integrate platform is that it has so many features that are hidden below the surface. The UI itself isn't as cluttered as other platforms and thus you've got to go through the documentation to really know how to best leverage their technologies. Overall: Integrate is a fantastic partner with AdSupply and I am sure we will be working with them for years to come. Highly recommended for both Buyer and Seller entities. Pros: - Variety of campaign types provides ample inventory for different publishers. - Feature rich site with ability to checkout buyer and seller profiles. With messaging system built in. - Developer friendly tracking system with custom subIDs, global variables and default redirection. Cons: From discussions with team members I learned a reporting API is available but its not visible or easy to find in the main portal of the website. Making the API easy to find and well documented would be nice. Overall: Solid platform with advanced campaign filtering capability backed up by a talented and dedicated team. I would recommend any publisher to work with the Integrate.com team. Pros: Easy to navigate system which includes a variety of advertising partners to choose from. It is very easy to grab links, banners and apply for programs that best fit our advertising methods. Reporting data is very easy to pull and very detailed. Fast payments and great support from account managers. Cons: I wish there was a newsletter or communication email which would alert us when a specific offer was added into Integrate that we would pre-qualify for (must be incentive). Overall: Great network with a lot of technology that other competitors lack. I love the fact that you can communicate with the clients directly and talk to them about ways to optimize the campaign and rates based on performance. Pros: The ease of the platform paired with a very thorough and helpful account manager is what makes using Integrate such a successful breeze. I've used the platform in the past, as well as several others so I knew what to expect using it this time around. The improvements definitely help, and having an awesome account manager that knows what they are doing increase performance ten fold. Cons: Aside from the implementation of the client side IO, everything has been great! Overall: I would definitely recommend the services and products that Integrate offers. It has been nothing short of amazing working with Scott and his relationship and knowledge of this space definitely shows in his work.